Tollywood Pawan Star Pawan Kalyan attends as a chief guest for the launch of Jr NTR and Trivikram's New movie NTR28 Puja ceremony took place on Monday. Green and yellow coloured set that was designed backdrop for the Occasion. 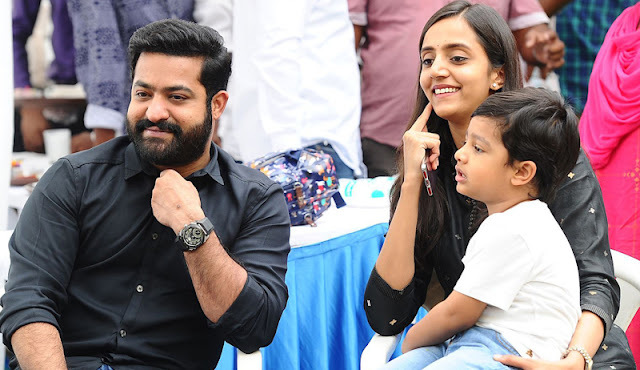 Jr NTR's wife Lakshmi Pranathi and son Abhay Ram were also in attendance at the puja Ceremony. The movie title is not yet confirmed and Trivikram Srinivas is the director of Jr NTR’s 28th film. Already we known well Trivikram Srinivas and Pawan Kalyan were currently working for a movie 'Agnathavasi'. Music director Anirudh Ravichander will compose the music for NTR's Upcoming movie. Meanwhile he is also composing the music for Pawan's new movie Agnathavasi. 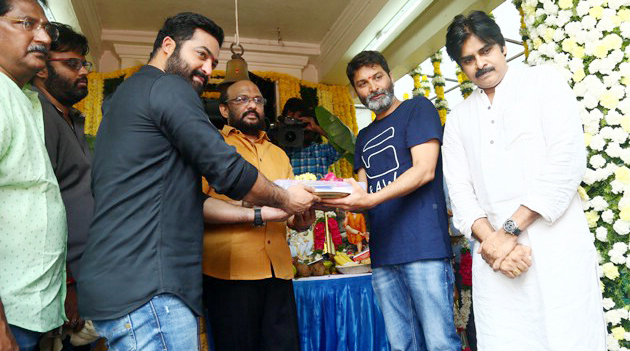 Jr NTR and Trivikram's combination movie is produced by Radha Krishna under Harika Hassine Creations banner. NTR28 puja ceremony video viral on social media and NTR, Pawan fans more happy about both of them seen interacting and posing for the Photos. NTR28 movie that is being bankrolled by Haarika & Hassine Creations. The puja ceremony of the video was broadcasted live on social media. Tags: Jr NTR’s next Movie, NTR28 film, NTR family members, Lakshmi Pranathi, Son Abhay Ram, Pawan Kalyan attends as a chief guest, Jr NTR and Trivikram's New movie. NTR28 Puja Ceremony. Mumbai: Two Drunk men died after falling into a 2,000 feet deep valley in Amboli Ghat of Maharashtra State. A video of their fall in valley has gone viral on social media Networking Sites. The body of Youth was recovered today, police said. The incident took place at Kawale Saad Point in Amboli Ghat on August 1, they said. Pratap Rathod (21) and Imran Garadi(26), who were part of a group of seven member friends, fell into the deep valley four days ago. All friends worked at a poultry farm in Kolhapur, police official said. According to police Statement that their friends left the Kawale Saad Point of Valley after spending some time, Both of them stopped there only and made some fun holding bottles in their hands. Their friends taking video while they were climbing fence around the edge of the valley and back tracking one more time. 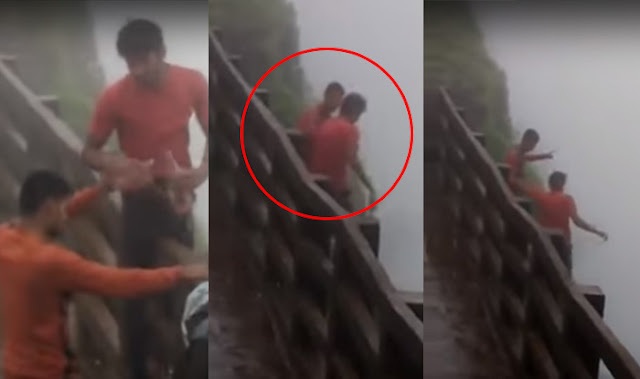 Then both of them standing on the edge, beyond the valley fence and slipping down, which is circulating video on social media shows, when their friends caputured the Video. Due to Heavy rain the Police and shopkeepers Hill Riders Group to search for the duo. The two bodies were spotted down and recovered in the deep valley, the officer said. Tags: Two Drunk men falling, 2000-ft deep valley, Pratap Rathod, Amboli Ghat, Kawale Saad Point in Amboli Ghat, fell into the deep valley Video Viral. New Delhi: Naturally newborn babies are barely able to keep their eyes open at the time of birth, The could not stand alone walking or even balancing on their own two feet. But a unbelievable video viral on social media networking sites. 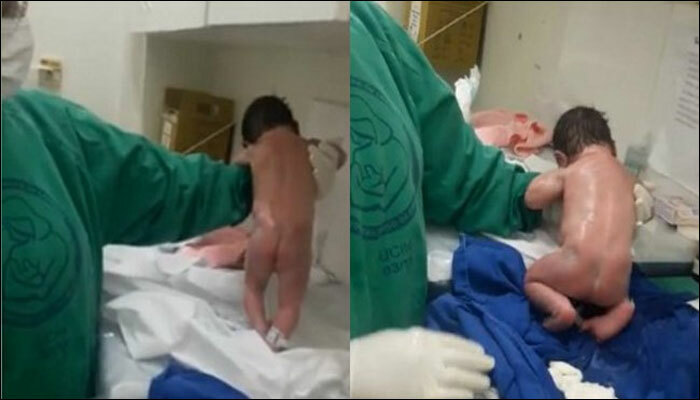 Newborn baby video that went viral as soon as it was posted. Just come out of its mother's womb and draped over a doctor's arm and actually balancing on its feet and walking on the bed. Now, this video gone viral on online. Tags: Newborn Baby walking, Newborn baby after birth Video Viral, Newborn baby walking and Standing, Video Viral, Newborn Baby, Newborn Babies.